at Galerie Rüdiger Schöttle, 2016. 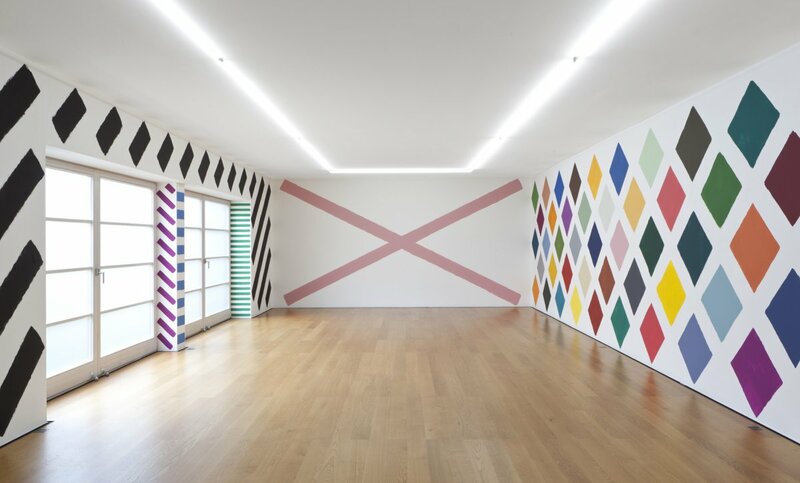 Martin Creed is known for his minimalist works and his approaches based on concept art. Rhythm, order, opposites, scales, everyday objects, and simple ideas are just as much subjects of his art as neon signs, films, music, and performances. Creed is at home in all media. He won the Turner Prize in 2001 for his “Work No. 227. The lights going on and off,” which was presented in the same year at Galerie Rüdiger Schöttle’s space at Martiusstraße. At the Open Art 2016, Creed will present a wall painting in combination with a new group of works. The mural is one of the earliest forms of artistic expression. From prehistory to the modern age, it has been one of the most important means of visual representation, but it is rarely seen in contemporary art. Martin Creed, who continues to surprise audiences with unexpected methods, has incorporated this neglected genre of painting in his repertoire. His expansive wall paintings are reduced to the simplest forms and colors. He thus analyzes and rigorously categorizes the fundamentals of painting in the painting itself. Martin Creed has long engaged in the practice of creating his works on site at the gallery. His art should be perceived as not only a clearly defined concept but also as immediate and vivid. The performative aspect is frequently foregrounded; the body movements in the act of painting yield the forms of his new works. The movements of dancers, for instance, became images by way of paintbrushes attached to their feet. Postmodern practices from concept art and action art are always essential characteristics of Creed’s artistic production. Martin creed was born in Wakefield, England, in 1968, and grew up in Glasgow. He lives and works in London. From 1986 to 1990, he studied at the Slade School of Fine Art in London. Solo exhibitions of his work have recently been presented at the Hayward Gallery in London (2014), the Tate Britain in London (2013), the Andy Warhol Museum in Pittsburgh (2013), the Museum of Contemporary Art Chicago (2012), the Musée d’Art Moderne et d’Art Contemporain in Nice (2011), and the Moscow Museum of Modern Art (2010). As an experienced musician, he has released several albums, including Mind Trap (2014), Chicago (2012) and Love to You (2012).